SCSCB is the Santa Cruz Chapter of the Society for Conservation Biology (SCB). The SCB is "an international professional organization dedicated to promoting the scientific study of the phenomena that affect the maintenance, loss, and restoration of biological diversity" (from their website). To promote the application of science in solving conservation problems and protecting biological diversity in our community. Sign up for SCSCB here! You can sign up for SCSCB without paying member dues, though we do request an optional $5 dues payment from all members. Paypal option to pay for your membership is coming soon! Carla Sette is a 5th year PhD student at UC Santa Cruz. She got her Master's degree at San Francisco State University, studying how host sociality and environmental factors play a role in present-day levels and the historical spread of the amphibian disease, chytridiomycosis. 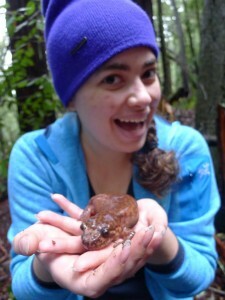 She currently studies climate-driven extinction risks of Sphaerodactyline geckos in South America. In her research, Carla employs mathematical modeling to describe complex ecological systems. 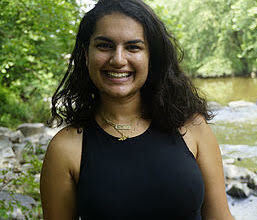 Sabrina Shirazi is a first year PhD student at UC Santa Cruz. She got her B.A. and B.S. from the University of Maryland in Anthropology and an individual studies major combining genetics, evolution and bioinformatics. While in MD, she worked with the Smithsonian Center for Conservation Genomics using DNA from archaeological and modern specimens to examine how and when humans were translocating animals. This allowed for an understanding of the antiquity and invasion of certain animals, informing decisions in the removal of animals for conservation purposes. At UC Santa Cruz, she will be continuing with similar research studying genomic level changes that can inform past human influence. Anna Nisi studies the puma (Puma concolor) population in the Santa Cruz Mountains, which is a variegated mosaic of different levels of road and housing densities, containing open spaces as well asrural, suburban, and urban areas. Broadly, she hopes to further characterize the behavioral, energetic, and physiological responses of pumas living in this human-dominated landscape, and she is specifically interested in how the energetic and physiological costs associated with living alongside human development impact puma survival and reproduction. 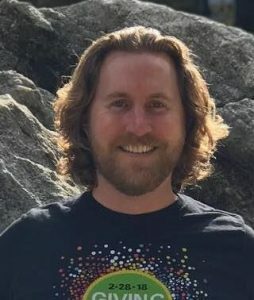 Daniel Wright is a first year Ph.D. student at UCSC in the Bernardi Lab.